Currently there is 10-15% growth observed on Latvia’s real estate market. Residents mostly prefer private homes and new project buildings, according to information from Swedbank. The average mortgage loan amount last year was EUR 66,000, which means 10% grown when compared to the previous year. The majority of real estate objects were bought in Riga – 60%. Demand in Pieriga and regions is similar – 20%, according to the bank’s information. As construction of private homes develops the ratio of apartment purchases declines. Generally 23% of residents decided in favour of purchasing private homes (an increase of two percentage points). As for the apartment segment, residents mostly prefer new project buildings (built in 2017 or 2018), where an increase of three percentage points was observed, according to data from Swebank. Generally, one fifth of apartments bought last year were in buildings built between 2000 and 2016. Every tenth apartment was bought in new project buildings. However, there is still a distinct preference for buildings built before 2000 (69%). As for the private home segment, 35% of purchased homes are new (built in the past two years). As for the second-hand market for private homes is active – 27% of residents have purchased buildings built between 2000 and 2016, whereas 28% of purchased buildings were built before 2000, the bank reports. As for the size of housing, demand for relatively large homes has returned – 23% of homes purchased in 2018 were larger than 250 m2. As a comparison – the ratio of such houses in Estonia and Lithuania is only 9% on the market. At the same time, however, demand is on a rise for housing smaller than 150 m2. 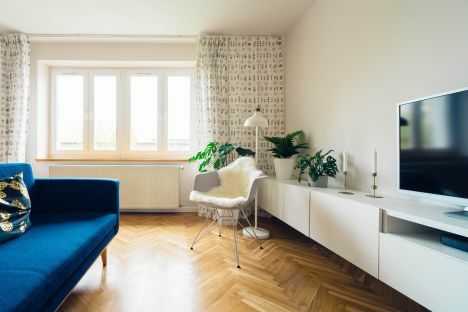 Swedbank experts note that the average area of newly-built private homes is usually around 170 m2, which is considered optimal for a family home. As for the apartment segment, smaller area apartments are in demand the most (38% prefer apartments that are 36 m2 or 55 m2), as well as apartments with an area 75 m2 (35%). «We can see that Latvia’s real estate market is becoming more active. New housing and commercial areas continue popping up, property purchase prices are also on a rise. However, positive changes in the economy, residents’ more responsible attitude towards housing purchase and a reasonable lending policy helps maintain balanced growth of the market,» says Swedbank Head of Mortgage Support Department Normunds Dūcis. «It is notable that caution is generally higher in Latvia, where real estate market grows slower than it does in Lithuania and Estonia. This caution is both rational and emotional, because income of households is on a rise, apartment price rise is moderate and housing accessibility in Riga is better than it is in Vilnius and Tallinn,» said Dūcis. In recent years there has been an increase for economy-class apartments (priced EUR 1,550 per 1 m2) in the new multi-apartment project segment. Last year, 65% of all purchase transactions in new projects were performed in the economic segment. There is active development of new projects in this segment. 2,000 new apartments are currently under construction. Another 3,500 are planned for the next three years, Swedbank notes. Much fewer purchase deals have been noted for business-class apartments (up to 2,500 EUR/m2) and exclusive apartments (more than 2,500 EUR/m2) – 24% and 11% of all purchase deals. The average price of 1 m2 for business-class apartments was EUR 2,100 last year. An average of 30 purchases was made every month. There are 800 apartments of this class currently under construction. The number of purchases made in the exclusive-segment is very small – about 15 purchases of apartments whose average price per 1 m2 is EUR 3,100, the bank reports. Currently the majority of all built private homes have only one floor (70%). Wooden frame houses are also on a rise popularity-wise (40%). This means wooden panels are manufactured based on special orders at factories, Swedbank reports.